Red River Real Estate and Vacation Rentals - Hillside Haven, Red River, New Mexico. Hillside Haven is a two story, four bedroom, two bathroom that sits up in the Red River Upper Valley. The large wrap around deck that offers plenty of room and seating for everyone in your party! You have access to the deck through stairs outside as well as being able to walk out from the kitchen onto the deck. When you walk up onto the deck and pass through the glass sliding door you will enter the dining area and kitchen. The kitchen is very spacious with plenty of counter space for several people to be in the kitchen at once! Across from the kitchen is the spacious living room. This living room has a TV and a DVD player giving guests the option of watching satellite or movies brought from home. The Flack Cabin also provides guests with free WiFi to use during their stay! When you walk down the hall you will find two bedrooms. The one to the right is equipped with a king bed for guest comfort, and the one to the left has a queen bed. Both of these bedrooms have access to the full hallway bathroom. Go down the spiral staircase and enter the second living room. In the downstairs living room there is a wood burning fireplace that heats this home very well! The TV downstairs is perfect for setting up a game console! Fold out the sofa to give your party an additional queen bed. Walk down the hallway to find two more bedrooms. The one to the right is equipped with two twin bunk beds and the one to the left has a queen bed. Both of these bedroom have access to the downstairs full bathroom. On this lower level you will also find that there is a separate laundry room with a washer/dryer for guests to use whenever needed. Step out from the living room to the outside. Two story cabin with no stairs to main level but several steps to kitchen and living room. One king bed, two queen beds, one queen sleeper, four twin beds. Large wrap around deck that has plenty of seating. All rooms in this home are extremely spacious. 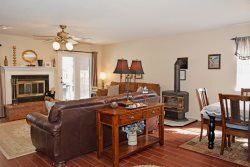 Living room includes TV, DVD player, entry to wrap around deck, a gas fireplace upstairs, and a wood burning stove in downstairs living room. Hillside Haven pet policy: Pet Friendly! Everyone was extremely friendly and knowledgeable. Everyone in Red River was. Beautiful property and relaxing environment. We will definitely be back! We loved working with Red River Realty, and our experience was the cabin we rented was amazing. thanks for being so helpful. We loved being outside of town but withing a few minutes of the ski base. The cabin was rustic and quaint but also very comfortable. This was the best time we've ever had in over 30 visits to Red River!